UK artist GIRLI is the voice of a generation, if there ever was one. Her unique style is a mix of candour and youthful frenzy, seeking not to please, but to divert anything and anyone mainstream. Writing her music, she appropriates contemporary concerns on freedom of expression and of failure and advocates for young generations’ right to take time and find themselves. 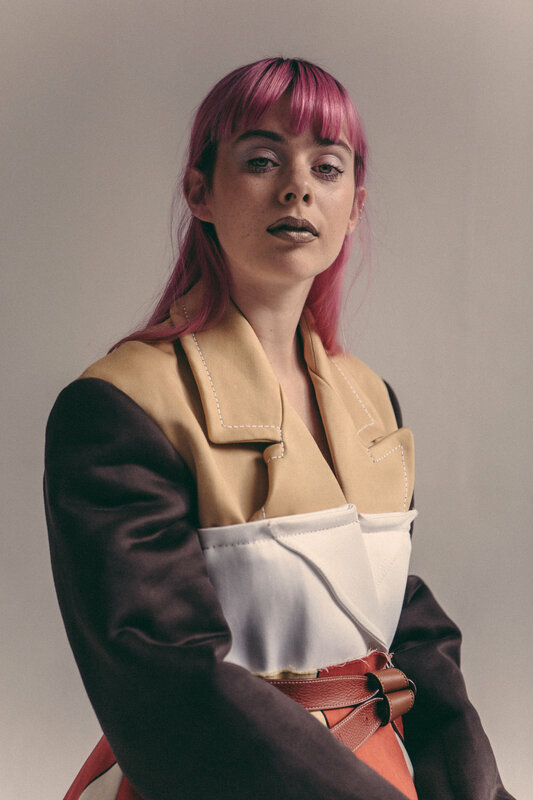 We spoke with GIRLI about her voice as an artist and activist, her interest in supporting young people, and the capacity of social media to host important conversations on critical topics. Dress by Loewe, Coat by Joseph and Boots by Alice + Olivia. Elena Stanciu: Tell us a bit about yourself. When did you start making music? Who/what inspires you? 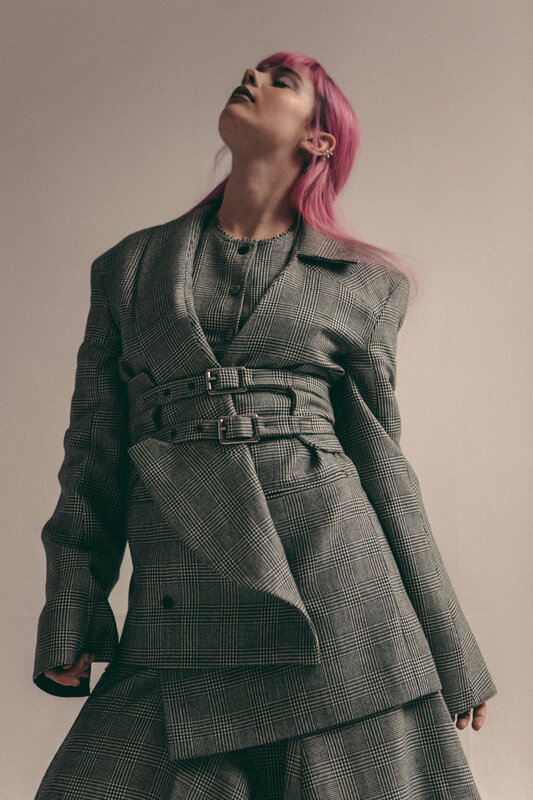 Girli: I always sang and made up little songs when I was a kid, but I started making music seriously when I was 15. School sucked, so I started a band, and then started playing gigs on my own with an iPod with backing tracks I'd made or ripped off YouTube, improvising over the top of them, and they eventually turned into some of the first GIRLI songs. G: Pop music for people who don't fit in. ES: Your recent single, Young, is very touching and relatable, written as you describe it "for the confused youth." Is there a story behind this song? What do you think confuses young people the most today? G: I wrote Young about the feeling of becoming a teenager/young adult and feeling like "woah hang on a second my parents didn't tell me it was gonna be this weird and confusing growing up." I think, because of social media, our generation struggles a lot with self-love and identity, as well as the pressure to decide what we want to do with our lives. We're constantly bombarded with images of the "perfect" body and the "perfect" life and it messes with our heads. Coat by Marni and Belt by Coach 1941. Dress by Paula Knorr, Coat and Belt by Marni, Boots by A.F. Vandervorst. ES: Can anything good ever come out of confusion? Most young people are also immensely creative – would you say there is a connection between youthful confusion and uncertainty and creativity and a sort of intensity of life? How can we make the most of it? G: Confusion hasn't always been a negative thing. I think the generations before ours were allowed a bit more confusion time than we are in current times. We need to make confusion beautiful again. A lot of it comes from the media, saying that young people are too technology obsessed and lazy – we're not, most of us are hyper aware of the world around us and how our generation is affected by it. Instead of shaming people who take time to figure stuff out as being "lazy" or "indecisive" or "crazy," we have to see how beautiful it is to be discovering life and not have it all sorted out in boxes. ES: I see you love pink. How did you "discover" it? What is it about this colour that appeals to you? G: I think at first it was about how much it shocked people to see me dressed head to toe in pink. I found the reaction so silly – it's just a colour; why did it grab people's attention and confuse people that much? Nowadays I just have my hair pink, it's my trademark. Full Look by Joshua Millard. ES: You use your voice and platform to speak up on very important topics – rights for LGBTQI+, justice for victims of sexual violence, awareness for mental health and eating disorders. Tell us a bit about what draws you to activism and what's in the future for you in this area. G: I've always been involved in politics and protest in some form or another, so with my music it wasn't any different. I think it's so important to speak up and use your voice to make a difference. I talk a lot on social media about issues that have personally affected me, like mental health and eating disorders, because I know what it feels like to feel so alone and like nobody cares. I hope that maybe someone would see a post I did and feel a bit less alone, like someone understands what they're going through. ES: What's next for Girli? G: Loads of new music. Loads more shows. A whole new chapter!